IMPORTANT: All files included in these project packages are free to use in personal and commercial renders but may not be distributed, sold or shared in any way. Two exceptions to that rule: Realmling's Dino and Trilo textures for the fairytale castle must not be used in commercial renders. If you create add-ons to these models (textures, morphs, etc. ), you can't sell them. Our aim is to keep Sara FREE. NOTE: To use Netta's Fairytale Underwear texture for Sara (fairytale13.zip), you need Tralfaz' make-up textures for Sara. Tralfaz has been kind enough to let us offer these textures here at 3dSC so you can get everything you need on the same page. For these reasons, we have included tralfaz' textures in the same zipfiles as Netta's texture. Thank you Tralfaz! If you download fairytale02.zip for the first time now, you don't have to download that update because it is included in the zipfile. I also corrected the location of the textures folders in this fairytale02.zip file. They were in Textures:NeilP, Textures:ParkerUnfolded, and Textures:Realmling. 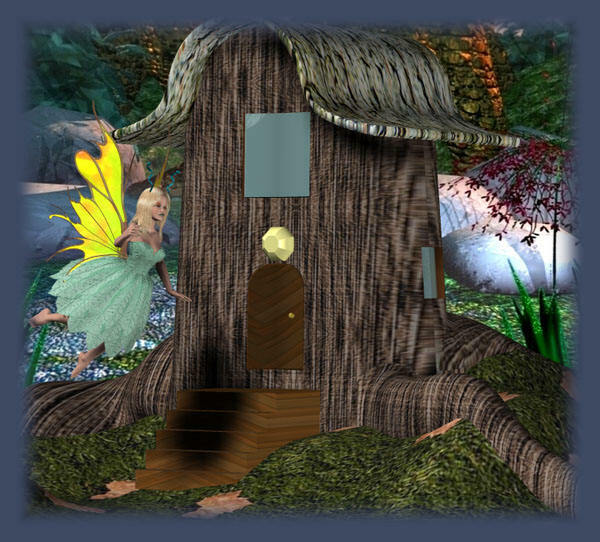 They must go into Textures:3dSC:Fairytale Project:NeilP, Textures:3dSC:Fairytale Project:ParkerUnfolded, and Textures:3dSC:Fairytale Project:Realmling. After our successful first freebie package release (3dSC Christmas Sara), centered around the wonderful Sara free figure by DarkWhisper, we at 3dSaraCreations thought we would turn our sights on a Springtime theme for the next release. Here you have it! Months of work by a variety of talented individuals teamed together with a single goal in mind have resulted in the 3dSaraCreations Fairytale Project! 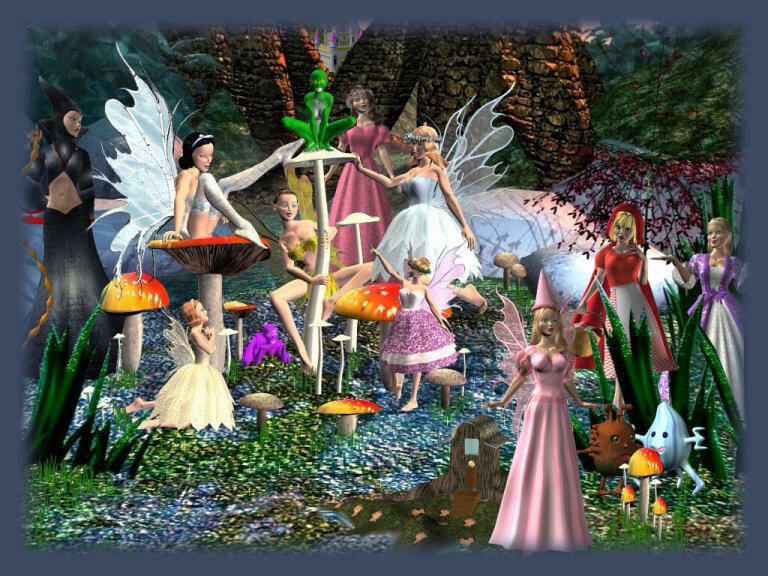 The 3dSC Fairytale Project consists of over 300MB of themed content including several dresses or outfits, scene props (all character-based to allow for easy MAT creation for your own textures), coaches, character morphs, faery poses, MATs for a variety of looks for each and every model, and even brand new posable figures! 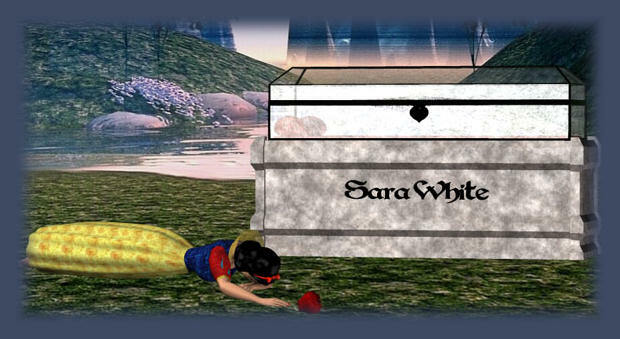 We looked to classical Fairytale themes for our inspiration, so now you have in your hands the basics for placing Sara in any one of a variety of classical Fairytale themes. 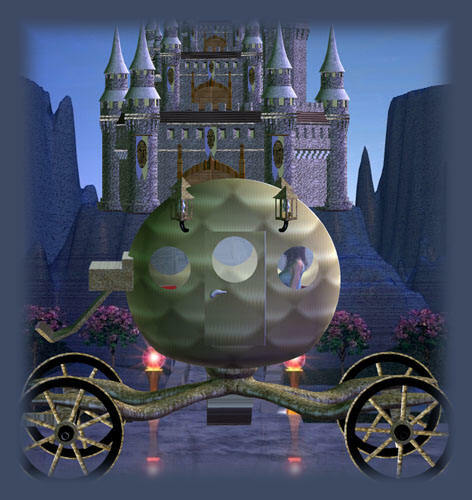 Beautifully rendered backgrounds for individual use, or for use with the Daz Cyclorama, Cinderella and her glass Slippers, Snow White and her crystal casket, Red Riding Hood and her picnic basket, spinning wheel, a castle, TWO thrones, a magic mirror, wands and wizard's staffs, wings, castles, woodsy hut and mushrooms and flora for fairy perching... They're all here, just for Sara (and a good deal more)! Our Morph and Makeup set includes options for both Sara 1 and 2, and all clothing options should work with either version of Sara. Several items will load by default with no texture applied. Just take a look in the Poses folder (all of our folders start with 3dSC) where you'll find a variety of MAT files to apply textures to all of the figures in this package. Due to time constraints we have not been able to include a Preview Image and ReadMe from each individual creator. All the base objects have both a Preview Image and a ReadMe, though some of the MATs go uncredited in the 3dSC readmes folder (which, by default, will unzip to a folder "3dSC Readmes" outside your Runtime folder). Listed below are all of those volunteers who gave of their creativity, hard work, and inspiration to make the Sara Fairytale Project happen. The 3dSC Project Team Admins are AngelSpirit, France, NeilP, MacDubhgal, and Realmling.